CEAHD (pronounced "SEED") Lithography stands for Computer Enhanced Analogue Hand Drawn Lithography. Computer Enhanced refers to the process of scanning and combining plates in the computer and adjusting color values. Analogue Hand Drawn means that each stage of the plates is drawn by hand. If they were drawn via mouse or any other type of computer controlled device, it would not be an analogue process, but rather a digital one. My method is to draw the plates on different textured surfaces and scan them into the computer using a flatbed scanner. Color is either applied or adjusted in the computer and then printed with a 6 color printer (pigment ink or water based dyes). Some prints are made with separate plates which are scanned separately and registered together in the computer and the colors printed at the same time, or the plates can be printed separately by registering them on the printer much the same as you would do with a press. This method is useful if you wish to build up the thickness of the ink. Other prints are done by re-scanning and reworking the same plate. After that they are sometimes combined with woodblock, stencil and hand coloring. The image is created in the process of making the print and that is what makes it a handmade original print. Four stages of the CEAHD litho print, "As If In Memory". Image 1 - (Plate 1 Stage proof 1): the drawing is done in black and white and then scanned in sections into the computer where it is "inked" with a bluish tone. Image 2 - (Plate 2 Stage Proof 1): this plate is drawn and painted in black and then scanned into the computer where it is also colored with a blue tone. Image 3 - (Plates 1 and 2 Stage Proof 3): the 2 plates are combined together. The work on the left is "Tea Break" (1987) created with traditional lithograph on metal plates. On the right is "Jinrikisha" (1998) created with CEAHD lithograph. Working with traditional lithography, the difficulty for me was to achieve the subtlety of what I felt was indicative of my style of drawing and painting. 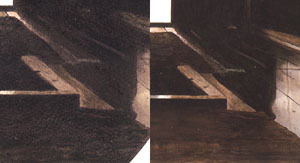 The problem with traditional lithograph is the integration of the plates that are drawn and the plates that are painted. Also, because of the oil-base pigment, only four plates can be used before the shininess of the ink builds up too much. This is a common problem which many artists who have tried lithograph are familiar with. Basically, it's the lack of subtlety of drawing with a grease crayon on a metal surface. While this method can produce certain aesthetic qualities, for my own work I was looking for something more subtle. The plate for Jinrikisha has been built up in the manner described above, ie. layers of drawing and painting on different surfaces to achieve the desired degree of subtlety. For me, the true aesthetic quality of a lithograph is in the quality of the drawing. In other words, I'm not looking to reproduce the effects of the original painting as a watercolour, but rather the aesthetics of a drawing combined with colour. Notice the difference in subtlety in these two images with regard to color transitions and drawing. These images are scanned at the exact same size relative to both prints. 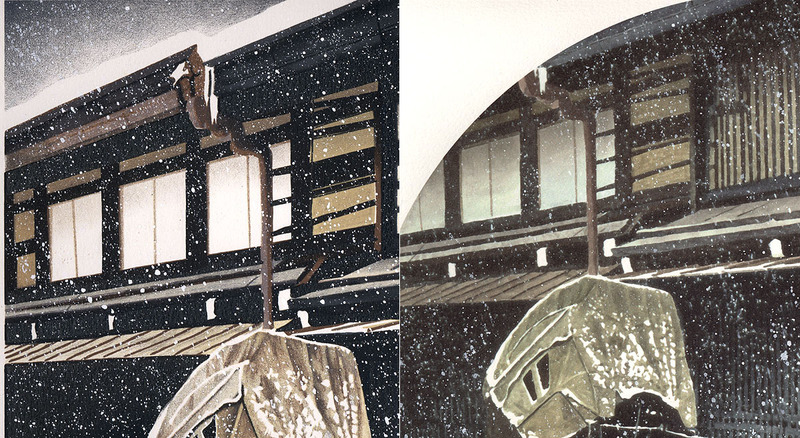 The difference between the watercolour and the CEAHD Lithograph. The left side is the CEAHD Lithograph, the right side is a photograph of the watercolour "Interior" which was done in a drybrush style on hot pressed paper. Note the drawing quality of the print as opposed to the drybrush watercolour.